I drive a beater, a clunker, a hooptie. It’s reliable and grey, and I never valet. I lived in New York after college and didn’t drive much until I moved to Los Angeles. I am actually driving the first car I have ever owned. People always wax nostalgic about their first car. 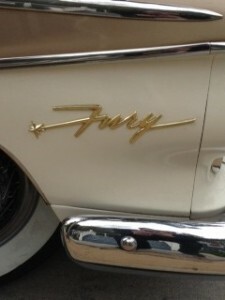 “I had a ’67 Mustang rag top,” or “I had a VW bus that we used to get baked in before class.” My story begins and middles with an ’89 Honda Accord, a name that would drive George Carlin crazy, so from here on out I’m gonna lie and say my 1st car was a Plymouth Fury, because fury trumps rage and aren’t we all full of the rage on the road?